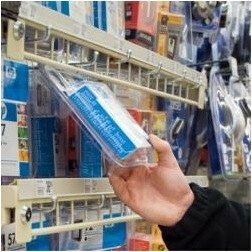 This unique system allows the entire product to be seen and held while remaining safely secured to fixture. Hinged front gate locks to secure product. Hooks secured to bar and slide into position. Tab insert secures fixture to gondola uprights.